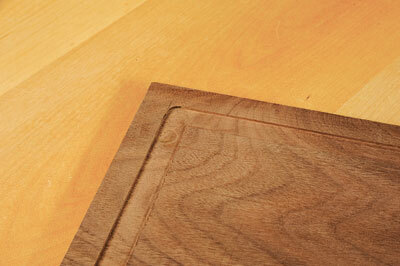 Inlay as decoration is still used in furniture making and is certainly very popular in box making. The line patterns that are created are used to emphasise edges and distinctions between colours, grains and textures of woods, often applied as veneers. In the past, the groove to accept an inlay was cut with a scratchstock or plough plane but today, I'm sure that the router is the most established means. Probably the most common pattern is the change of direction of a line that forms a 90° corner which needs to be squared with a paring chisel to remove the rounded change of direction caused by the router cutter. While the level of skill needed to control the chisel is well within the capability of most craftsmen, the risk of over-cutting is not something that can be ruled out. We all make mistakes and the time and frustration to repair the fault is a nuisance. Quite often, paring these corners is multiplied by the numbers in a pattern or the repetition if the decoration is applied to a batch of pieces. This is certainly a factor that I experience in my use of inlays when I make a batch of boxes. Andrew Crawford, the internationally renowned box maker has come up with The Precision Inlay Corner Jig to address this problem. It's another example of his sense of vision and depth of involvement in his pursuit of quality control and skill in his work. 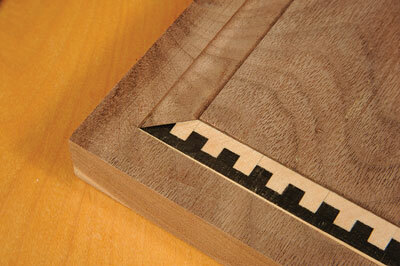 He based his design on the excellent Veritas corner chisel. The jig consists of a base plate, which has two ribs on the underside that locate with the outer edges of the routed groove. 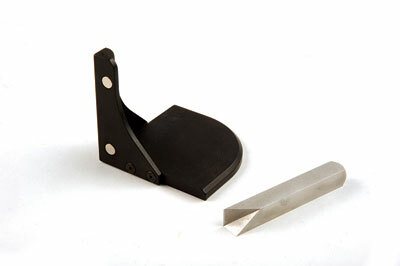 The corner chisel is precisely guided by a vertical corner bracket that lines the chisel with the groove below and the chisel is then struck with a hammer. Voila , a perfectly pared corner every time. The jig is very well engineered and manufactured by Lee Valley but does not carry the Veritas name as it was not designed by them. 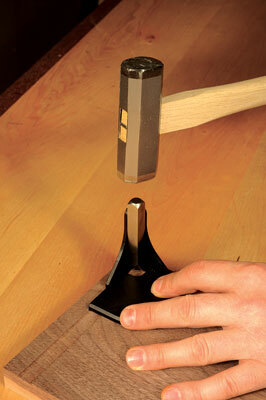 The ingenious use of rare-earth magnets to hold the chisel into the internal corner of the upright bracket eliminates another element of manual complication when the hammer is struck. It is available direct from Andrew and he offers purchasers a £10 discount off a weekend box-making course or a day of one-to-one teaching in his Shropshire workshop.